Luxury detached three bedroom villa, great views, private pool, sleeps up to 8 people; 2 double bedrooms, 1 twin, bed settees. Perfect location, easy walk to shops, restaurants, bars & sea (12 mins). Villa Jasmine is a delightful detached three bedroom holiday villa that comfortably sleeps up to 8 people; it has two double bedrooms and one twin bedroom that can take an extra bed. In addition, there are two bed settees in the lounge. The accommodation includes a comfortable lounge and a fully equipped kitchen, dining area and two bathrooms with showers. The three bedrooms, lounge, kitchen and dining area have air conditioning. The villa offers a peaceful holiday retreat with a good sized private swimming pool in lovely garden surroundings with sun and shade. There is a rooftop terrace with a BBQ area, Turkish style curtained seating area and lovely views of Kalkan, the sea and Taurus mountain range. The villa is fully serviced and useful information is included in the visitors' welcome pack. Wireless broadband is available free of charge. A mobile phone is provided for guests' use. For more information and guest reviews please message us. If you have never been to Kalkan and watched the sun go down on Kalkan bay then it should be on your must do list! 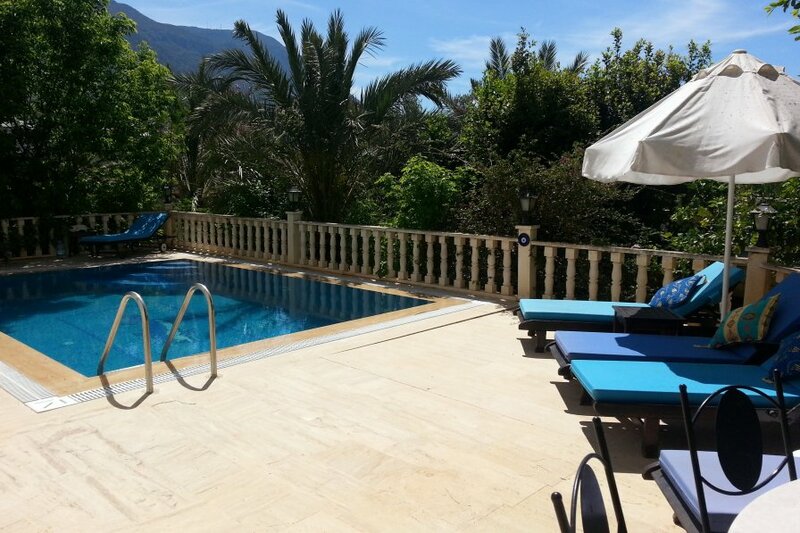 Kalkan is a rare find in these days of mass tourism. It is far enough away to escape the crowds yet pleasantly geared for the most discerning visitor. Nestling in the foothills of the impressive Taurus mountain range around a pretty working fishing harbour, Kalkan entices you to want to get to know it better with so many little alleyways welcoming you with overhanging balconies, rooftop restaurants and pretty boutiques selling everything from jewellery, handbags and ceramics to nuts and turkish delight. Kalkan town centre is a short walk from the villa and the walk through the town down to the harbour takes around 15 minutes at a normal walking pace but slightly longer on the way back as the return journey is up hill. Taxis are readily available for anyone who doesn’t fancy the walk. Water taxis from Kalkan harbour will ferry you to various Beach Clubs where you can find water sports, retaurants and sun beds. There are excellent beaches in the vicinity and the pebble beach next to the harbour is a favourite with crystal clear water fed by a mountain stream. The beautiful and peaceful surroundings make it a lovely place to watch the sun go down over the bay. A short dolmus ride takes you to Kaputas beach, a stunning sandy bay nestling between rocky outcrops. Patara, an historic area and famous long stretch of beautiful sandy beach, is about twenty minutes away by dolmus or taxi. For those looking for adventure there are beautiful mountain and hill walks along the Lycian Way. To relax afterwards why not try the Turkish baths (Hammam) 10 minutes' walk away from the villa? There is a dulmus (bus) station nearby for trips further afield. Boat trips are widely available, inexpensive and a great way to view the beautiful coastline from the sea. Lunch is provided onboard and is delicious, followed by swimming and snorkelling in little bays. Local supermarkets stock a wide variety of foods and there are greengrocers, butchers and bakeries close by. Changing currency is easy either in the many banks on the main road or for a slightly better rate at some of the shops which double up as currency exchanges! Most restaurants and some shops will accept sterling if you have run out of turkish lira. You are certainly spoiled for choice with over 100 restaurants, serving simple dishes as a snack or a full three course unforgettable dining experience.